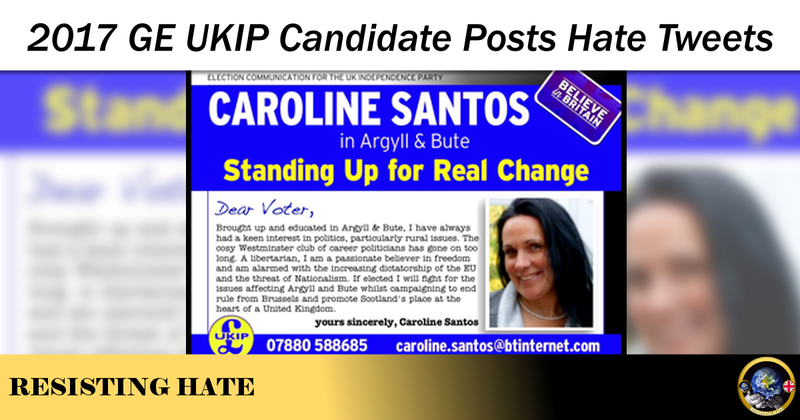 Caroline Santos was the UKIP candidate for the Scotland constituency Argyll and Bute. She plans to contest the Rutherglen/Hamilton West seat at the 2017 General Election. We came across Caroline very recently when this tweet was brought to our attention by an anonymous third party with concerns that an individual representing a mainstream party should not be expressing such divisive and discriminatory views. 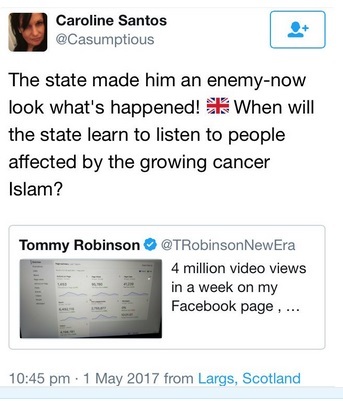 It would also appear that Caroline’s issues do not end with Islam. She also likes to share her racist views on Twitter too. We did try to ring but the line was engaged. 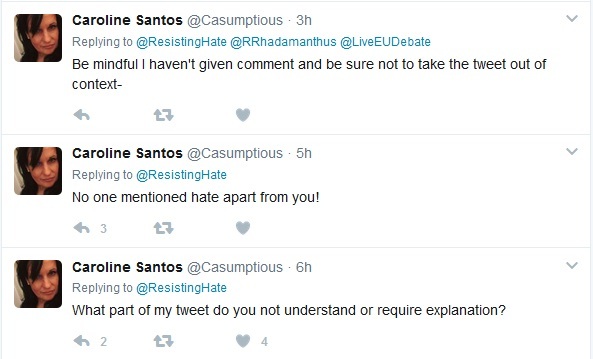 However we are more than willing to update our article if Ms Santos would like to offer any comments explaining how she believes her rabid Islamophobic views would be of benefit to either the UKIP party or the constituents she hopes to represent. The issues raised here can only be explained in one of two ways. 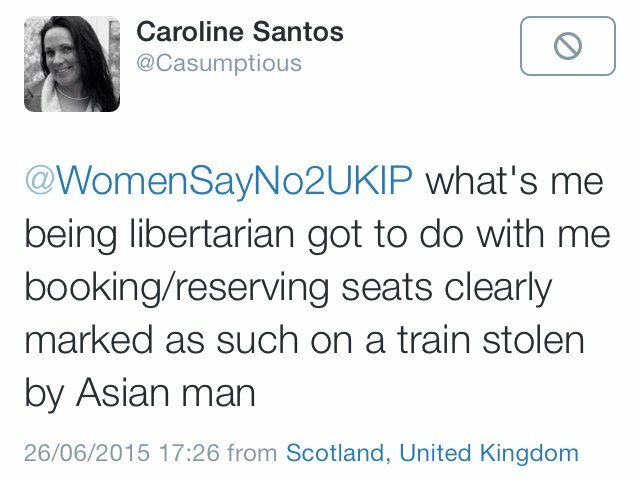 Either UKIP are intentionally recruiting Islamophobic bigots as candidates to represent them or Caroline Santos’ tweets are not indicative of the UKIP ethos in which case she is misrepresenting them and should be asked to stand down. We shall look forward to either an admission from Nuttall that UKIP actually is the racist, Islamophobic party we and other critics believe it to be or a resignation from Caroline Santos confirming her extremism is not compatible with the UKIP manifesto. You simply remind anyone, Asian or not, that your seat is already reserved for you. You don’t, unless you’re so inclined already, use that incident as a handle to spout Islamophobic loathing. What if Farage had taken your seat by accident, and was so intent on listening for other languages being spoken in his presence that he didn’t notice your complaint? If Farage had taken her seat, she would have spent the next hour telling him how brilliant he was and offering to have his baby. And she would have stayed standing.